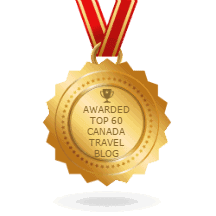 Parksville, BC – Canada Travel is happy to announce the TOP 10 Tourism Businesses in Western Canada. 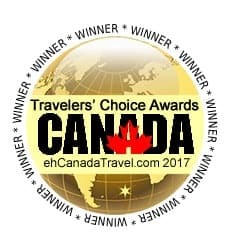 Traveler Choice Awards are the highest honor ehCanadaTravel.com can bestow. Award winners are selected by travelers who visit the website, social travel communities, 9 social media channels and blog. The results are derived from the millions of views from the accumulation of website analytics and statistics, social media and blog interactions over the past year. Canada Travel currently publishes over 2000+ tourism listings in Western Canada. These annual awards reflect “the best of the best” of the accommodations and attractions. The Travelers’ Choice list is unlike any other because their travelers are unlike any other. Analytics show their travelers are part of the fastest growing tourism sector online – the active 25-44 year old. Their mindset is different than older travelers as they search travel using social media (#) hashtags, not search engines, and they prefer the outdoors exploring and sightseeing on their own or with adventure tours, guides and activity companies. This is right in Canada Travel’s wheelhouse as they are the only social media and content marketing website promoting Canadian travel in real-time everyday and they provide park, trail, and activity destination photos and information for research. “Canada Travel is a new-type of travel website. It is the first and only social and content marketing style booking, planning website on the internet. It is 100% interactive. We and participating Travel Influencers including tourism businesses, bloggers, photographers, media, event planners and publishers create and post photos, videos and content to the website. All who post receive the credit. We provide a unique way to create exposure and credibility in your marketplace,” says Greg Girard, Chief Tourism Whisperer, Co Founder of Canada Travel. So, why just Western Canada awards? Because it takes a long time to create Canada when it is all self-researched by Canada Travel and participating Travel Influencers. Simply put, Canada Travel has to collect all the information themselves. They are, currently, marketing 500+ communities in British Columbia, Alberta and Saskatchewan and expansion into Northern, Central, Eastern and Atlantic Canada will be complete by the summer of 2017. “Content is king. In Canada, tourism is a monopoly and information is not shared by government tourism associations unless you are part of their club. Private tourism must accumulate their own information and photos. On many fronts the tourism associations are doing us a favor as we must be a boots-on-the-ground research team resulting in us actually experiencing what we write about,” smiles Greg Girard. “And by providing a website where travelers can book, research and interact nationally, globally and socially with all types of accommodations, attractions and fellow travelers in real-time is why these awards are even more special,” adds Colin Girard, Web Ninja, Co Founder of Canada Travel. (1) Sunshine Houseboat Vacations, Cranbrook, BC : Sunshine Houseboat Vacations, the only houseboat company on Lake Koocanusa offering All Inclusive pricing and a full service marina. (2) Pawistik Lodge, Hanson Lake, Saskatchewan : At Pawistik Lodge, we have the perfect mix of accessibility and wilderness, lake and river fishing. While you’re on the river, you’ll seldom see another boat or human being, with the kind of great fishing that this suggests. (3) Kiwi Cove Lodge, Ladysmith, BC : Country Lodge with 12 spacious Guest Rooms on a private 11 acre waterfront Kiwi Farm & winery. Private ensuites, queen/king beds most with views and decks. (5) Misty River Lodge, Radium Hot Springs, BC : Backpacker’s Lodge in the Rocky Mountains. Hosts Gaby (from Germany) & Geoff (from Australia) love nature, traveling & meeting people from around the world. (6) Prairie Lake Vacations, Riverhurst, Saskatchewan : Cruise the sparkling waters of Lake Diefenbaker on the Betty Lou Tour Boat Enjoy a Dinner Cruise, Sunset Cruise, Badlands Cruise and so much more. (7) Expanse Cottages. Nordegg, Alberta : Plan Your Escape to the Natural Woodlands of the Eastern Rockies! The perfect place to gather with friends and family or for a romantic getaway with someone special ! (8) Enchanted Forest and Skytrek Adventure Park, Revelstoke, BC : A rainforest is the setting for 350 handcrafted and painted fairy folk figurines and a experience adventures among the treetops on a rope course. (9) Nakusp Hot Springs, Nakusp, BC : Nestled deep within the natural beauty of the Kuskanax valley, the Nakusp Hot Springs offers over 200 acres of year round outdoor recreation opportunities. (10) Three Valley Lake Chateau, Revelstoke, BC : Nestled in the Monashee Mountains. 180 rooms, restaurant, indoor pool, gift shop. Next door, visit the Heritage Ghost Town, Railway Roundhouse & Antique Auto Museum. ehCanadaTravel.com (eh Canada Travel & Adventure) is the largest travel and adventure website for booking, interacting and planning travel in Western and Northern Canada. The “eh Team” of eh Canada Travel & Adventure are a group of travel explorers, called Tourism Ambassadors, who research the many opportunities in travel, history and adventure so to assist travelers in booking and planning their next vacation to Canada. Watch for the launch of Eastern and Atlantic Canada in 2017.